BOCA RATON, FL--(Marketwired - January 26, 2015) - Earth Science Tech, Inc. (OTCQB: ETST) ("ETST" or "the Company"), a unique biotechnology company focused on nutraceuticals, bioceuticals and dietary supplements, announced today that ETST has received results from the Sponsored Research Agreement with the University of Central Oklahoma, a public institution of higher education, showing the effects of its CBD (Cannabidiol) Rich Hemp Oil (provided by Earth Science Tech, Inc.) on immune cells. This study illustrates that ETST CBD Rich Hemp was capable of Stimulating and Enhancing Tumor Necrosis Factor alpha (TNFα) Production by Macrophages. Under the sponsorship of Earth Science Tech (ETST), researchers at the University of Central Oklahoma have been investigating the effects of CBD on immune cells with ETST using the ETST CBD Rich Hemp Oil. Led by lead investigator Dr. Wei R. Chen, the team found that ETST hemp oil solution used in appropriate CBD concentrations could stimulate macrophages, an important immune cell, through the production of TNF α. The cytokine TNF α is a key cell signaler in the recruitment of immune cells. Maintaining a healthy immune system is key in health and may help in the fight of cancer. Furthermore, they also found that the CBD was capable of enhancing TNF α production by macrophages initiated by other compounds. Dr. Chen's team believes that the effects of hemp oil enriched with CBD on immune cells may be used to improve cancer treatment, particularly in combination with other treatment modalities. In collaboration with Dr. Chen, ETST plans continued studies to determine the effects of hemp oil with CBD on inducing and enhancing anti-tumor immune responses. Dr. Chen, who is also UCO's Assistant Dean of the College of Mathematics & Science, is a world-renown scientist and researcher, possessing a considerable decades-plus track record in laser breast cancer treatment research. Dr. Chen has published over 110 research articles to date and is a fellow of the leading not-for-profit interdisciplinary organization dedicated to advancing the science and application of light, the International Society for Optics and Photonics. The purpose of this study is to investigate the effects of CBD Rich hemp oil on immune cells. B.1. Preparation of CBD solution: The CBD Rich hemp oil (5.5% CBD) used in this experiment was provided by Earth Science Tech, Inc. The CBD solution was prepared by dissolving the hemp oil in DMSO solution to achieve appropriate CBD concentrations. B.2. Animal immune cell line: RAW264.7, a mouse macrophage-like cell line, was used. The cells were cultured in DMEM, supplemented with 10% fetal calf serum (FCS), in 5% CO2, 95% air, at 37°C in a humidified incubator. B.3. Stimulation of macrophages: The stimulation of macrophages was assessed by TNF α production, using a mouse TNF α ELISA kit. To study the effects of hemp oil on macrophages, cells were seeded in a 24-well plate (2×105 cell/well) in 1-ml medium in each well for 12 h, and then incubated with hemp oil solution of different CBD concentrations (0-10 uM) for 24 h. Cell supernatant was collected for ELISA analysis. To study the effects of hemp oil on enhancing macrophage stimulation by lipopolysaccharides (LPS), cells were seeded in a 24-well plate (2×105 cell/well) in 1-ml medium in each well for 12 h, and then incubated with LPS (1 ng/ml) and hemp oil solution of different CBD concentrations (0-10 uM) for 4 h. Cell supernatant was collected for ELISA analysis. C.1. Dose dependence of stimulation effects on macrophages by CBD: After the macrophages were incubated with hemp oil of different CBD concentrations (0, 1, 2.5, 5, 10 uM), the TNF α production by the cells was detected. The effects of CBD are given in Figure 1. 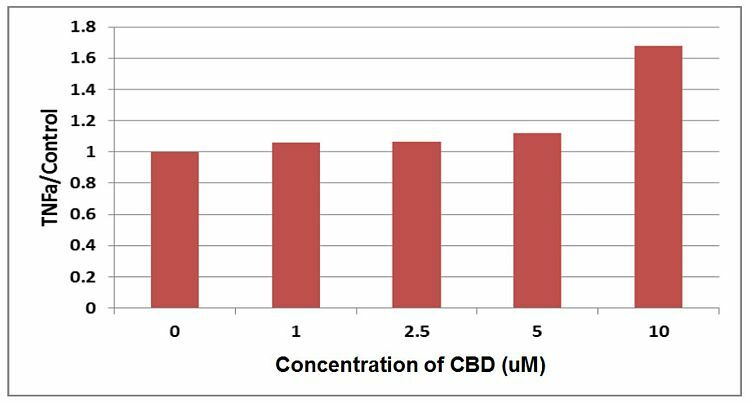 The results in Figure 1 indicate that the impact of CBD on macrophages in the concentration range of 0 to 5 uM is not significant. However, CBD with a contraction of 10 uM induced TNF α production at a significantly higher level. C.2. Effects of CBD on enhancing LPS induced TNF α production: After macrophages were incubated with LPS (1 ng/ml) and hemp oil (CBD concentrations of 0, 5, and 10 uM) for 4 h, the TNF α production was detected. 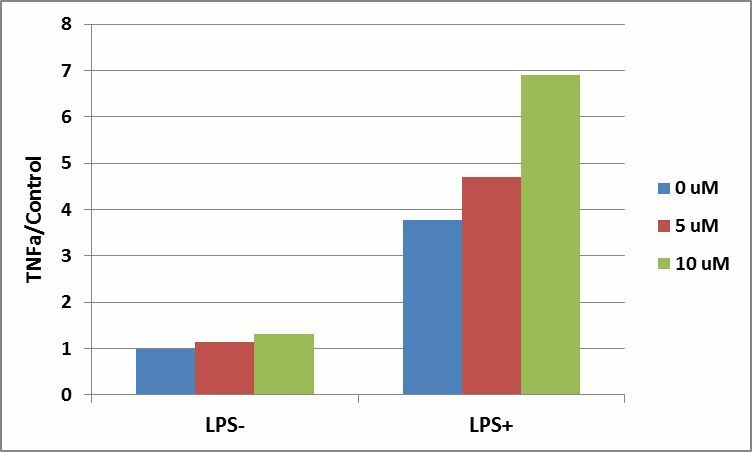 Effects of the LPS combined with hemp oil are shown in Figure 2. The results in Figure 2 show that hemp oil can enhance TNF α production by macrophage stimulated with LPS, especially at a CBD dose of 10 uM. D. Conclusion: The results of this preliminary study indicate that with appropriate CBD concentrations, hemp oil can stimulate macrophages to produce TNF α (Figure 1) and can also enhance the TNF α production stimulated by LPS (Figure 2). The effects of CBD Rich hemp oil on immune cells may be used to improve cancer treatment. However, further experiments, particularly in vivo studies, are needed to determine the effects of CBD Rich Hemp Oil on inducing and enhancing anti-tumor immune responses. ETST is in the business of manufacturing and marketing products which utilize the CBD component of hemp oil for overall health, wellness, nutritional and palliative purposes. ETST invites all interested parties to contact the company directly at info@earthsciencetech.com in regards to securing its High Grade CBD (Cannabidiol) Rich Hemp Oil for wholesale, resale, private labeling or distribution. Furthermore, ETST is now offering the availability for the Health and Wellness markets, consumers and its shareholders to try its CBD Rich Hemp Oil in small quantities at discounted prices online at www.earthsciencetech.com/cbd-rich-hemp-oil/. ETST is open to forming new strategic partnerships, joint ventures and/or supplying vendors, resellers and third party distribution companies with its High Grade CBD Rich Hemp Oil at wholesale prices in order to better help supply the health and wellness markets on a large scale. The company feels it can grow at a much faster pace by focusing on becoming a large wholesale distributor of its High Grade CBD Rich Hemp Oil and by aligning itself with key strategic partners and third party resellers that are already well diversified in the Health and Wellness markets. ETST remains focused on building a strong intellectual property portfolio and it is doing just that. ETST is quickly becoming a leader in the CBD Rich Hemp Oil marketplace. On another note and furthermore, ETST recently announced it Secured a Ground Breaking Second Provisional Patent for its CBD (Cannabidiol) Rich Hemp Oil Because of its Findings with the University of Central Oklahoma and the Effects of CBD on Immune Cells. Under the sponsorship of ETST, researchers at the University of Central Oklahoma have been investigating the effects of CBD on immune cells with ETST using the ETST CBD Rich Hemp Oil. ETST would like to let the market and its shareholders know that this new patent (Patent Name is "Cannabidiol Compositions and Uses 2," Serial No. 62102538) was filed because of the positive ETST new findings under its sponsorship with the University of Central Oklahoma (as shown in the above Immune cell report and effects of ETST CBD Rich Hemp Oil on Macrophages). These finding are breakthroughs in this field and are a result of the ETST new relationship with its international raw supplier of a higher quality CBD Rich Hemp Oil and its sponsorship with the University of Central Oklahoma. With these new studies and test results, ETST has 2 provisional patents and inventions with its CBD Rich Hemp Oil (patent Serial No. 62102538 and patent Serial No. 62061577). Additionally, ETST has a total of ten (10) new claims for its Hemp Oil Enriched with CBD (Cannabidiol) and Hemp Oil Enriched with Proprietary Additives. Partial Abstract of new Patent Serial No. 62102538: A composition having cannabidiol, alone, or as a component of hemp oil, for use in treating or preventing cancer. The composition may include D-limonene, which contributes synergistically to the anticancer efficacy of the composition. ETST would like to thank Dr. Wei Chen and the College of Mathematics and Science at the University of Central Oklahoma for this recent report on the effects of its CBD Rich Hemp Oil on Immune Cells and for working with us. Dr. Wei Chen, a veteran laser cancer treatment specialist who received his master's and Ph.D. degrees in theoretical high-energy physics from the University of Oregon, has done extensive work in the area of laser treatment of breast cancer and is working with a foreign drug company to advance and exploit the technology under development. Dr. Chen is a world renowned scientist, researcher and university professor whose laboratory is prominent in various areas including the application of CBD (Cannabidiol). ETST goal is to help consumers Worldwide with their overall health and wellness through cutting edge nutraceuticals and dietary supplements. ETST is also focused on making a positive impact in the health and wellness industry through advanced formulations with its CBD Rich Hemp Oil. ETST previously announced positive preliminary test results on the effects of ETST Hemp Oil Enriched with CBD-Cannabidiol on Animal Breast Cancer Cells and on Normal Cells. ETST had previously announced that the initial report from the Sponsored Research Agreement with the University of Central Oklahoma and its lead investigator Dr. Wei R. Chen showed the effects of its Hemp Oil Enriched with CBD-Cannabidiol (provided by Earth Science Tech, Inc.) on animal breast cancer cells and on normal cells. The results of this preliminary study indicate that with appropriate dose, in this case with ETST proprietary Hemp Oil Enriched with CBD-Cannabidiol dose, Hemp Oil Enriched with CBD-Cannabidiol can inhibit the proliferation of cancer cells more than that of normal cells. This purpose of the experiment with the University of Central Oklahoma and its lead investigator Dr. Wei R. Chen was to investigate the effects of ETST Hemp oil Enriched with CBD-Cannabidiol on animal breast cancer cells and on normal cells. If Hemp Oil Enriched with CBD-Cannabidiol has the same effect in vivo, it may help with cancer patients. ETST does not grow, sell or distribute any substances that violate United States Law or the controlled substance act. ETST does sell and distribute hemp based products. ETST High Grade CBD (Cannabidiol) Rich Hemp Oil: ETST High Grade CBD (Cannabidiol) Rich Hemp Oil is natural and formulated using a wide array of cutting-edge technologies. ETST is capable of supplying and offering its High Grade CBD Rich Hemp Oil in all 50 states and over 40 countries as a nutritional and dietary supplement designed to support overall health and wellness. ETST's High Grade CBD Rich Hemp Oil is All Natural and derived completely from the federally legal industrial hemp plant. Industrial Hemp (Hemp) is not marijuana and will not get you 'high' and it does not require a medical license of any kind to authorize purchase. It is lab tested multiple times during the manufacturing process, from seed to shelf. This also includes being tested for CBD content, other Cannabinoid content, yeast/mold/fungus, and bacteria like E. coli to ensure safety and top quality. Cannabidiol (CBD) is a naturally occurring constituent of the hemp plant (seed, stem and stalk). It is the most abundant non-psychoactive cannabinoid in hemp, and is commonly used as a dietary supplement to support general health, immune system support, the nervous system and much more. Research shows that many scientists and doctors think the cannabinoids work synergistically to support the whole human endo-cannabinoid system (internal and natural human cannabinoid system). Furthermore, many scientists and doctors believe the endo-cannabinoid system plays a fundamental role in the functioning of many of the major human physiological systems, including the immune and nervous systems. Hemp oil contains CBD -- a non-psychoactive compound of the plant. There are millions of hemp oil consumers around the world and this number is rapidly rising with an increasing number of reports and studies showing a variety of benefits of hemp oil. ABOUT NUTRITION EMPIRE (www.nutritionempire.com): Nutrition Empire is a wholly owned subsidiary of Earth Science Tech, Inc. (ETST) located at 4583 Ponce DeLeon Blvd., Coral Gables, FL 33146. Nutrition Empire is a specialty retailer and direct marketer of health, wellness, sports nutrition and dietary supplement products at competitive pricing. It operates through 2 segments: Retail and Direct Online. Some of its products include sports nutrition products, vitamins, minerals, botanicals, herbal and dietary supplements, ETST CBD Rich Hemp Oil, homeopathic remedies, green living products, diet products, beauty aids, and other wellness products. Nutrition Empire's upscale retail location will have competitive pricing and carry the top health and wellness brands as well as the hottest new sports nutritional supplements in the market place. The company specializes with one-on-one customer care, service, relationship and experience. The Nutrition Empire retail space is on ground floor of an upscale luxury apartment home community called the "Gable Ponce" that houses a built in customer base with Class A+ rental/living units above the retail shops where Nutrition Empire is located. The Gables Ponce complex will soon begin its 3rd phase of development and looks to have roughly 1,000 apartment units when completed. Nutrition Empire is on the bottom floor of Gable Ponce within the retail shops and right next door to Epicure Gourmet Market (www.epicuremarket.com), which is a 24,000 square foot upscale gourmet grocery store and a dedicated restaurant, with an outdoor patio, coffee and juice bar. Furthermore, Nutrition Empire is located adjacent to "The Village of Merrick Park" (www.villageofmerrickpark.com) which is a 780,000 square foot upscale lifestyle center consisting of mixed-use retail, residential and office project anchored by Neiman Marcus and Nordstrom, and has more than 100 other select retailers including Tiffany & Co., Burberry, Coach and Gucci. The Village of Merrick Park also houses Equinox gym (www.equinox.com), which was voted best gym in America by Fitness Magazine and I AM CrossFit (www.iamcrossfit.com/locations/coral-gables). Nutrition Empire is located under 1 mile from the University of Miami (www.miami.edu) (informally referred to as UM, U Miami, Miami, or The U), which is a private, nonsectarian university located in Coral Gables, Florida, United States that enrolls roughly 16,935 students. Figure 1. TNF α production by macrophages after incubation with hemp oil of different CBD concentrations. Figure 2. TNF α production by macrophages after incubation with LPS and hemp oil of different CBD concentrations.